In accordance with the Principle 9 of Malaysian Criteria and Indicator (MC&I) Natural forest, KTSP is committed to monitor and manage the HCVF identified in SLFR. A Standard Operating Procedure (SOP) has been established to address a systematic method to manage those areas. About 1.5 ha of land covered by nepenthes plants has been identified as HCVF. This area is located in Compartment 49, which is declared as Protection Zone by KTSP. Thus, there will be no activity inside the compartment. Serves as fauna’s mineral source, this area is crucial for feeding sites. Steep area with abundant of huge commercial trees (Compartment 58). Located in post-logged compartment, 9.5 ha of steep land (more than 25° slope) filled with huge dipterocarps was declared as HCVF by KTSP. 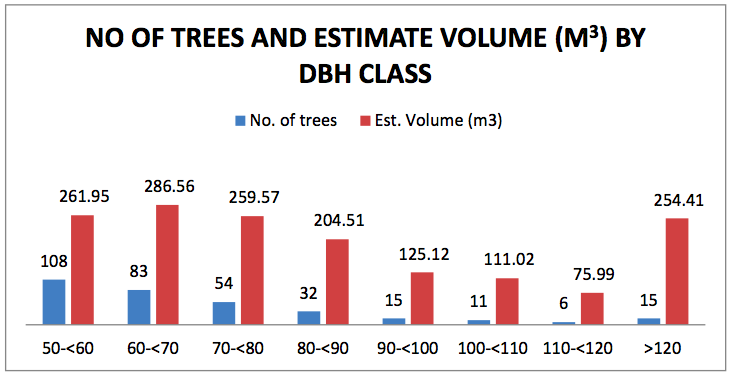 A total of 324 trees with DBH above 50 cm were recorded in the area. The biggest tree girth is 140 cm (Selangan Batu). Located in compartment 26, the three-tier waterfall conserved as a symbolic for KTSP initiative to conserve all water catchment area and therefore regarded as HCVF 4.2. Documentation involves mapping and site demarcation reporting. GPS points are recorded, and map of the sites shall be prepared to ease monitoring activity. Forest Officer and Wildlife Officer shall monitor the conservation area at least once a year to ensure the no encroachment or significant changes of the area. The management of HCVF in SLFR is challenging. Open discussions and affiliations will be done continuously in order to plan and implement good management prescriptions for HCVF in SLFR. Table shows the commitment of KTSP for maintenance or enhancement of HCVF in SLFR. All protection areas including land with >25⁰ slope, land within 30 metres of rivers. *Value 2, 3, 5, and 6 is not applicable for SLFR. In line with the regulations by federal or state government, all area gazetted as protection area will be left out for any forest operation, which include Riparian Reserve, stream buffer zones, and steep areas. Addition to that, all poor areas will also be rehabilitated, and no logging is allowed until the area recovered. HCVF for flora in SLFR, which is the Nepenthes sp. and dipterocarps plot, will be monitored annually to ensure there is no encroachment. Major changes such as forest fire will be prevented, therefore a fire plan will be produced for that area. KTSP does not have plan to conduct researches in the area yet, as manpower and expertise is limited. However, higher education institutes who are willing to conduct their study is encouraged. As part of huge wildlife corridor that connects several forest reserves (Segaliud Lokan-Deramakot-Tangkulap), KTSP is committed to monitor fauna status in the area. A wildlife unit has been formed since 2013 to conduct monitoring and assisting on enforcement.